Setting up a freshwater aquarium is a rewarding project, but it can be somewhat daunting at first. Deciding on which fish, plants, filtration, and other accessories to get requires careful consideration. The whole process has to start somewhere and that, of course, is with the tank itself. The number of choices of freshwater aquarium designs on the market today is quite large. The sizes range from 1 gallon to aquariums in the hundreds of gallons, and water volume is not the only variable. There are many differently shaped tanks now, too. The basic rectangle is still far and away the most popular shape, but hexagons, 'L' shaped, square cubes, and more can be found. A new style that is becoming more popular in recent years is the bow-front aquarium. This is a rectangular tank with the front side bowed out (so from above it resembles a 'D' shape) to give a better viewing experience. 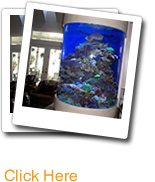 Choosing the right Richmond aquarium is not as simple as deciding what size and shape will look best in your home. It is important to know how tank shape will affect the fish that can be kept in it. It may seem a bit like putting the cart before the horse, but you should think about what fish you would like to have before you buy the tank. Why is this the case? How do the type of fish and the number of fish play into the tank shape? Consider the issue of the number of fish first. Most everybody knows that you should not overcrowd a fish tank, but what constitutes overcrowding differs from tank to tank. A very common rule of thumb for how many fish an aquarium can hold is one inch of fish per one gallon of water. This is not entirely accurate, and it does not take into account taller, narrower tank shapes. A much better rule of thumb is based on surface area of the tank, not the volume, and it states that for every one inch of fish there should be 12 square inches of surface area (12 square inches, not a square foot). With the surface area rules to guide you, a 40 gallon hexagon-shaped tank would only be able to hold about half as many fish as a 40 gallon rectangle-shaped tank. The rectangular tank would have much more surface area, so it can carry more fish. The larger surface area is important for the gas exchange in the water. The fish need dissolved oxygen that the water gets from contact with the air. More surface area equals more air contact which means more oxygen for the fish. The type of fish you want also determines the best tank shape. Different fish prefer different water levels, i.e. surface dwellers, mid level swimmers, bottom dwellers. It would be a bad idea to fill a tall hex shaped tank with very active surface swimmers like danios or fish that like a large bottom area to roam. Slower mid-level swimmers like goldfish or angelfish may be a better choice. Of course, if you are just getting into the aquarium hobby and have no idea what type of fish you would like to have, then you can buy whatever size and shape tank that you prefer. When it comes time to buy fish, though, the tank size, shape, and surface area must be factored into the fish buying decision. Above all, just make sure some planning goes into the process of choosing the freshwater aquarium design for your home. Do not rush the decision and everything will work out fine and you will have a healthy, beautiful aquarium to enjoy for many years.